Walking through the market in Syracuse, Sicily, there are piles of artichokes everywhere, and if you even pause in front of them the vendor will quickly offer you a deal that’s hard to pass up. But we are picky, taking our time to stroll up and down and look at all the stands, reveling in what Emanuele calls il momento del carciofo – the artichoke moment. This differs from il periodo del carciofo, which is the entire artichoke season, while il momento is the peak, brief and glorious. We must seize this moment to feast on artichokes. During il momento, you cannot even think of buying less than 20 artichokes, and often bundles are sold in lots of 25 or 30. Since the artichokes come with their long stems and bushy leaves, one of these bundles is roughly the size of a small Fiat. After a thorough perusal of the market, we buy from an overflowing truck doing a brisk business. The artichokes are small, firm and taut, the leaves crisp, the edges of the stems still wet with artichoke juice, meaning they have been harvested a very short time ago. We plunk down our 6 euro and become the proud owners of 30 fine artichokes. After we wrestle the bundle into the backseat, we fill in the remaining space in the car with our bodies, and head back home, all the while discussing various ways to cook artichokes in Italy. 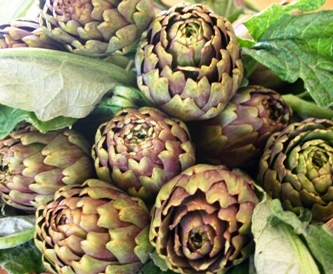 We are even thinking about having our own little Festa di Carciofi and inviting family and friends for an artichoke feast – fried artichokes, artichoke risotto, stuffed artichokes, artichoke pasta, raw artichoke salad – we are high on the artichokes fumes that have permeated the car. One of my favorite ways to prepare artichokes calls for small tender ones like we bought today. Somehow, when I translate this dish into English, it comes out half-French: Artichokes au Gratin. I like the sound better in Italian, so here’s the recipe for Carciofi Gratinati. This simple dish can be served as an appetizer or a side dish. Or if you are like me, you can devour an entire pan for lunch. 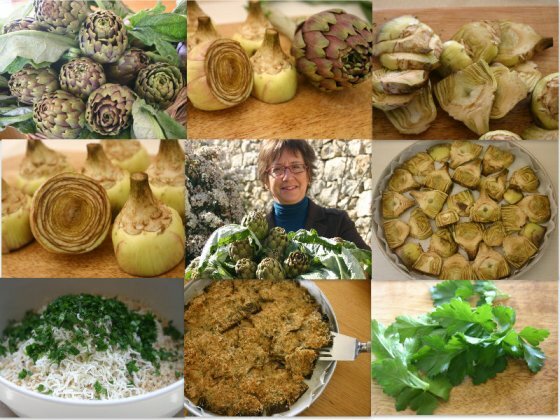 Fresh small artichokes and their preparation, with the final result, a panful of baked carciofi gratinati for lunch. Great post—I can smell the artichoke fumes. I’ll try the recipe. We usually just stuff them (with breadcrumbs, garlic & asiago), drizzle them with olive oil and steam them.